It was Sept. 2, her 42nd birthday, when Mary Anne Christo learned she was pregnant. She and her husband, Eric Waksmunski, 46, were looking forward to having another child. Their son, Jesse, was 2. Eric Waksmunski and his wife Mary check on Wyatt before going to Shane's room during a hospital visit. Days before Christmas, the Mahoning Township couple received another unexpected gift when they learned they would be having twins, two more boys to be exact. The family was overjoyed. The babies were due May 9, Mother’s Day. Almost from the beginning, Christo’s pregnancy was difficult. Within a week of getting the news, she developed hyperemesis, an almost disabling form of morning sickness that lasts all day, every day. As soon as she drank any fluid, she began vomiting, sometimes up to 50 times a day. The illness prevented her from working and required weekly visits to the doctor, and then the hospital, where she received intravenous fluids to keep from becoming dehydrated. She was eventually put on a medication given to cancer patients undergoing chemotherapy to help with the nausea and vomiting. It didn’t. After experiencing the same thing when she was pregnant with Jesse, Christo knew delivering the babies would be the only relief she would get from the almost constant vomiting. “You’re so dizzy constantly, as if you are out on a bad sea. Usually when you vomit, you feel better. But with this, you cannot get a reprieve. Your head is always spinning and you have to lie down all the time,” she said. She knows of only two other people who have had the same experience. According to the Hyperemesis Education and Research Foundation, approximately 10 percent of women will terminate a pregnancy due to complications of hyperemesis, and many more consider termination out of desperation. Failure to treat or insufficient treatment can result in metabolic imbalance and organ failure, and termination of the pregnancy could be recommended to save the life of the mother. 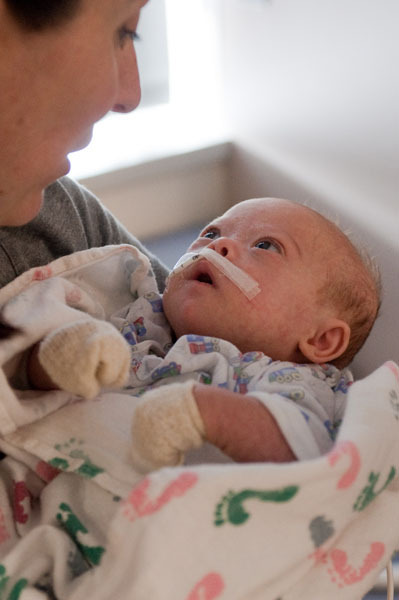 Shane locks eyes with his mother during one of the parents' hospital visits. She was so sick when she was pregnant with Jesse that at six months, she didn’t even look pregnant. That was not the case with the twins. Although she continued to suffer with the hyperemesis, her uterus was getting quite large — larger than it should be. Having failed a quad screen test (a maternal blood test given between the 16th and 18th weeks of pregnancy and used to determine the risk of delivering a baby with an abnormality), it was recommended that Christo undergo a level 2 (or high level) ultrasound to give the doctors a better look at what was going on inside her uterus. After the test, on Dec. 21, the couple learned Christo was carrying twin boys. They were told it was common to fail a quad screen when carrying multiples, and that the test showed no sign of any abnormalities in either baby, other than the amniotic sacs (the membrane that surrounds the baby and is commonly known as the ‘bag of waters’), appearing to be a little large. It was something the doctors said they would keep an eye on. “We left elated, thinking ‘Oh my goodness! We’re having twins. It’s the greatest thing. They’re both healthy and no problems!’ And that was probably the best Christmas I had,” said Christo. But by early January, things started going down hill, and by mid-February, the pregnancy was in jeopardy. “I was in the hospital probably two weeks before I gave birth to them because I was so ill,” said Christo, who had also developed polyhydramnios, which was causing an excess of amniotic fluid in the sacs. Polyhydramnios could have one or more causes, such as maternal diabetes mellitus (high blood sugar) and Down syndrome. It can also cause cord prolapse, which can result in the death of the fetus. The doctors also determined the placentas for both babies were defective. Eric Waksmunski pulls the covers back to get a look at Wyatt during a hospital visit. The buildup of fluid was causing serious problems for the babies. The doctors removed a liter of fluid from “Baby B’s” amniotic sac, but the cord was still prolapsed. They could have tried the same procedure on “Baby A,” which was Shane, but did not want to keep poking the placentas. Hoping to learn what was wrong with her placentas, Christo asked the doctor to send the tapped amniotic fluid out to be tested. She remembers the perinatologist tried to discourage her, saying testing wasn’t necessary as they had no concern about any type of abnormalities with the babies. It would be a week before the results came back. In the meantime, an early birth was looking more likely. In preparation for an early birth, Christo was given betamethasone shots. A steroid, betamethasone is used to further lung development in a fetus when an early delivery is expected. Christo was still 10 weeks away from her expected due date, but the risk to the babies was too great. To wait any longer could mean the loss of one or both of the babies. While taking one baby and not the other was not an option, it would only have been a matter of time with Shane, as his placenta was also deteriorating. “Wyatt was just in more of a critical state,” added Waksmunski. Doctors were unable to give the couple any answers as to why Christo was having so many problems. The couple began to prepare themselves for an early delivery. Having a Caesarian section with her first child, Christo expected to have a second one with the twins, just not so soon. “My whole thing was what is a three-pound baby going to look like,” said Christo. The nursing staff secured permission from the mother of a premie for Christo to see her baby. She knew what to expect, and was prepared, but neither she nor Waksmunski were ready for what happened next. “When I think of the next day, oh my God, how my life changed,” recalled Christo. Shane and Wyatt were born on Saturday, March 6. Doctors immediately suspected that Wyatt had Down syndrome, but were not sure about Shane. On Monday, they received the results from the amniotic fluid Mary had requested be tested — Wyatt had Down syndrome; further tests proved that Shane did as well. The odds against both boys having Down syndrome, especially being fraternal twins, were astronomical. With time, the shock and grief melted into acceptance and an understanding that their lives have changed. “I truly, truly take life one day at a time,” she said. “People always say, you should just live for today, and I didn’t. I would dream for this in the future or this, or think of this, or 10 years down the road, and I truly only live for today, where I didn’t before. “I really felt like, in the beginning, when this first happened, like I couldn’t dream, because what I had dreamed, was no longer an option anymore, so I just felt like I couldn’t dream anymore, but now, I’m just dreaming different dreams,” said Christo. Waksmunski said his priorities have changed. “What was important on March 5 is no longer as important on March 6 for us, even silly things. I’m a big sports fan, and I have yet to sit down and watch a complete baseball game this year. I find myself doing medical research. I find myself doing things to take care of my kids. I go to the hospital, and there was a time when it was hard to get me away from the TV, and today, is that the most important thing? So the Mets lost, so what? I think you learn how fragile life is. “We’ve gone to bed many nights, hoping that our kids don’t die overnight. And that changes your perspective on life,” he said. 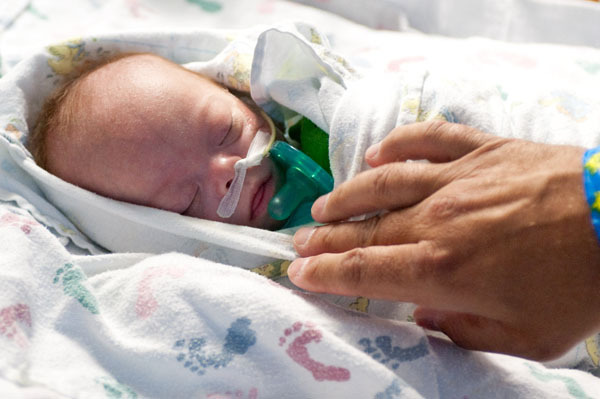 The first few months of Shane and Wyatt’s journey have been difficult. The boys spent many days fighting for their lives. As the Waksmunskis faced these challenges, they opened themselves up to a new community where they found not only support, but became part of a new family that has embraced them, shared their stories, their ups and downs, and helped them navigate a new path, not the one they anticipated, but one that promises to have its own joys and special moments. Next month, read about Shane and Wyatt’s months-long hospital stay and their long-awaited homecoming. According to Dr. Brian Skotko, a physician in the Down syndrome program at Children’s Hospital Boston and a member of the board of directors for the National Down Syndrome Society (NDSS), Down syndrome is “the most common chromosomal condition in humans,” in that one out of every 733 single-baby births will have Down syndrome. “It’s a condition where the person has extra DNA material,” he said. There are three types of Down syndrome: Trisomy 21, Translocation, and Mosaicism. Each type has no known cause or cure and affects people in all races. Trisomy 21 is the most common form of Down syndrome, affecting 95 percent of all individuals diagnosed with the chromosomal variation. The DNA error occurs prior to or at conception, when a pair of chromosome 21s in either the sperm or the egg fail to separate properly. The extra chromosome is then reproduced in every cell that is developed, resulting in 47 chromosomes being present in all cells, rather than the normal 46. Translocation is known to affect 3 to 4 percent of individuals with Down syndrome. This is the only form of Down syndrome that can be inherited, depending on the parent’s genetic material. According to the Mayo Clinic website, if one of the parents is a “balanced carrier” of translocation, meaning that their genetic material is rearranged in some way, the odds of a child having Down syndrome can range from 3 to 12 percent, depending on which parent is the carrier. Mosaicism is the most rare form of Down syndrome, affecting only 1 to 2 percent of individuals with this condition. It occurs when three copies of chromosomes are replicated in some of the cells during embryo formation. This means that some cells will have 46 chromosomes, which is needed for proper development; while others will have 47.